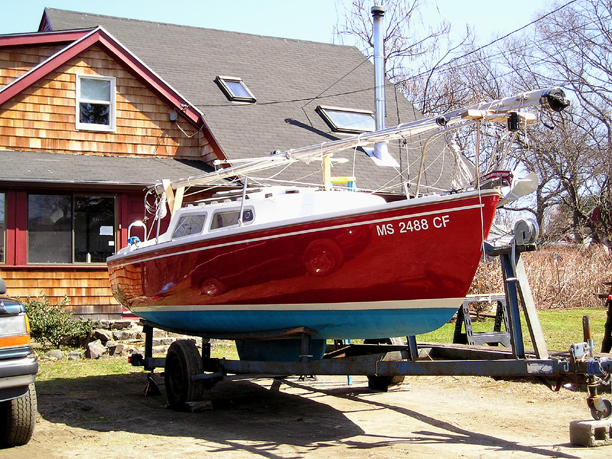 I don't do much towing (the 2005 season's tow up to Portland, Maine and back down from South Addison being an exception -- see the first photo below), but do haul-out Chip Ahoy in the fall (just last week this year) and drive it the mile or two home, leave the mast atop the boat for the winter and cover all with a big tarp, then tow to launch in the spring. 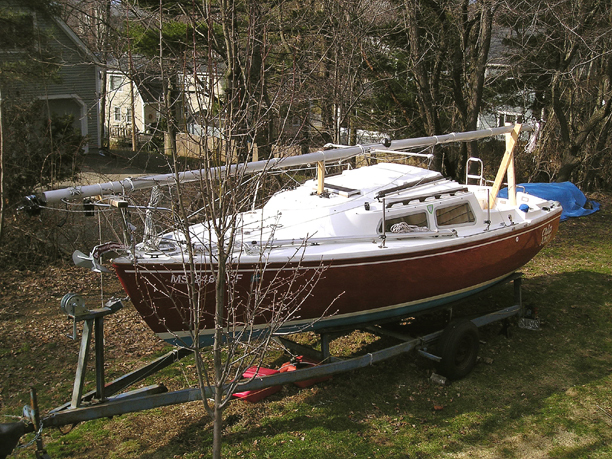 In the early spring when I uncover the boat, I take the mast down and set it up alongside on sawhorses so that A) I can work easily on the mast, and B) it's not in the way of work I'm doing aboard Chip Ahoy. 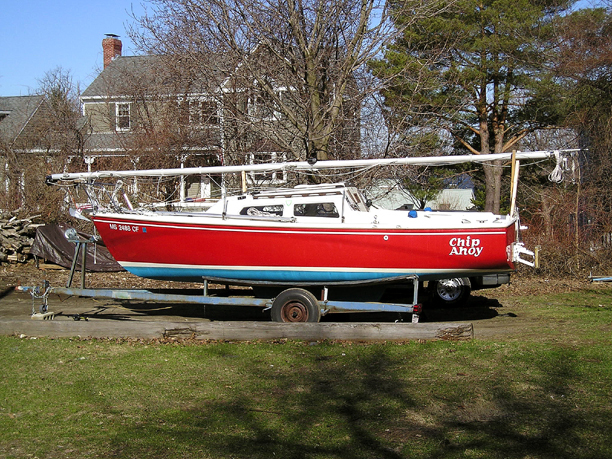 When I bought "Take Five" (which I renamed Chip Ahoy) in December of 2002, the previous owner had let the mast rest on the sliding hatch for apparently quite a long time (years? 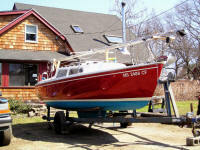 ), and its weight had dented and cracked the fiberglass at the hatch's aft edge upon which it laid. 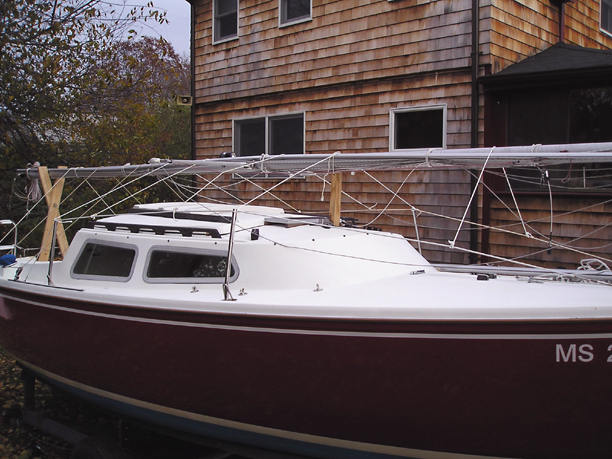 One of the first things I did on Chip Ahoy over that initial winter was remove the hatch (and all the teak trim and handrails) as my first indoor project. I had to bend the hatch and fiberglass the serious cracks; make the hatch whole again. 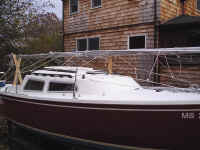 I did a lot of "custom sanding" of its edge to get it even, and replaced the teak trim. It's not perfect, but close. There's still a slight depression that I can find when looking for it, but overall it works -- though still a bit too tightly. 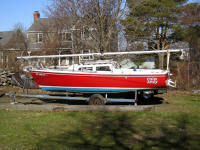 You don't want the weight of the mast resting on the sliding hatch, at least for any length of time, trust me. 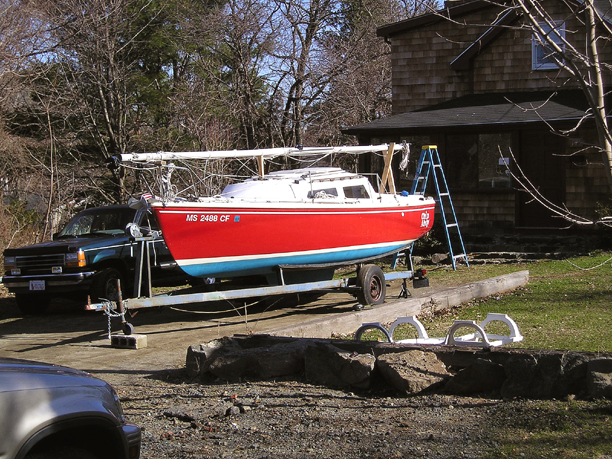 I usually tow the short distance to launch and haul-out with the 9.9 hp outboard attached, but when Wally and I towed the boat up to Maine, I removed it for the long haul. 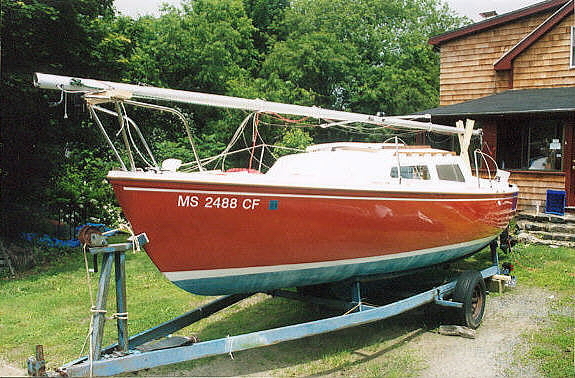 Removing and remounting is a bit of a pain: with its electric-starter and alternator, there is a lot of cable and wires that have to be run through the air-vent cowl, forward beneath the cockpit, and hooked-up to the dual-battery system, ignition switch, and charging system. 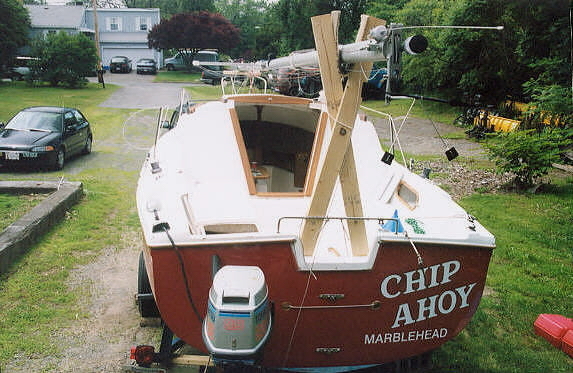 The first year I owned Chip Ahoy, I built the X-frame for the cockpit out of two-by-fours, a bolt through their center for axis, a couple eye-bolts to fasten it to the boat, and a piece of plywood I stick beneath its feet to disperse the weight on the cockpit sole; I also use the transom scupper drains to run lines into, around the legs, and back out to steady the legs low. 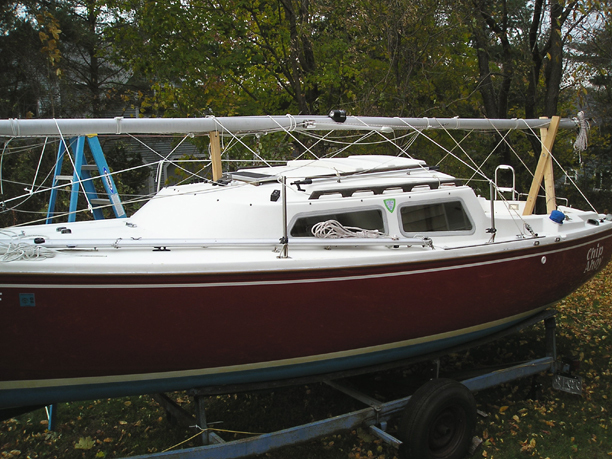 I stapled a piece of carpet between the V for the mast to rest on. 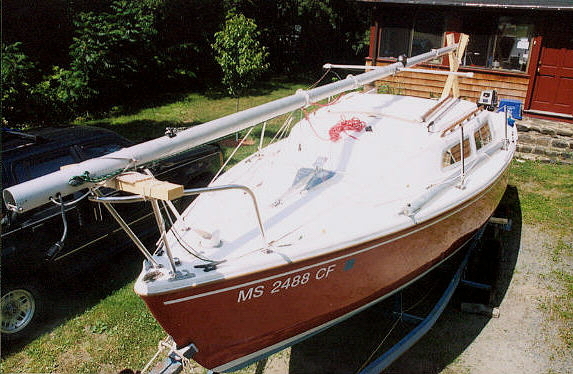 At the bow, I use a short length of two-by-four that I drilled two holes in on each end through which I pass a rope that's tied off around the bow pulpit at their vertical stanchions (to keep it from sliding around) and over the mast to hold it secure. 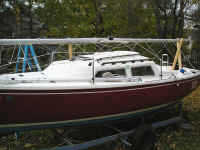 I stapled a piece of carpet on it for the mast to rest on. 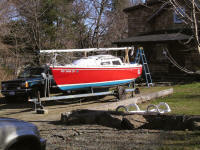 A year later, I added the middle support, a piece of 3" X 3" oak I happened to have handy at the time. 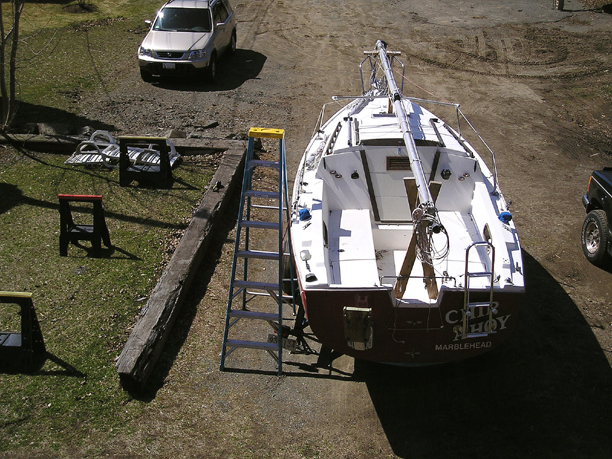 I cut the top with a Skilsaw to the shape of the mast's curve; drilled a hole for the mast step plate bolt to pass through, then secured it to the mast step plate. I also drilled a hole through its top for a rope, which I run through then up around the mast and tie it tightly. 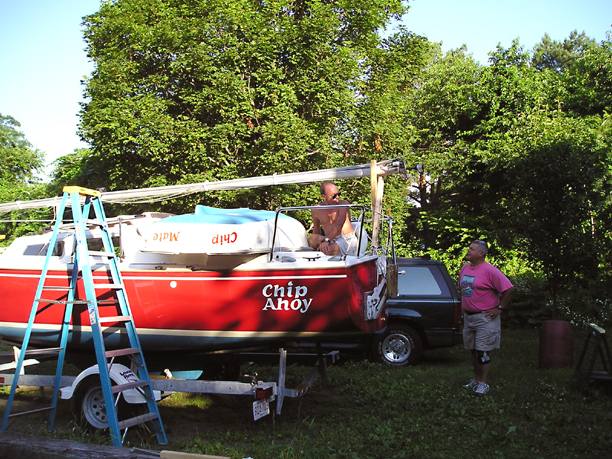 When I had the boatyard haul-out Chip Ahoy last mid-July to paint the bottom and drop it on Wally's trailer for the drive up to Maine, they stuck a length of two-by-two into the base of the mast then lashed the roller-furler drum to it, as it extended (the extrusion somewhat bending from its weight) about 18" beyond the mast. 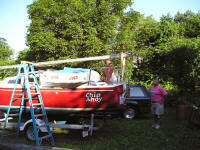 I've since adopted that improvement.